This easy recipe for Sweet Cinnamon Raisin Bread requires yeast and has fantastic flavor and texture. Simple to make & you’ll love the wonderful scent as it bakes! This recipe is a hit! This was my first time baking raisin bread and it turned out beautiful and delicious. 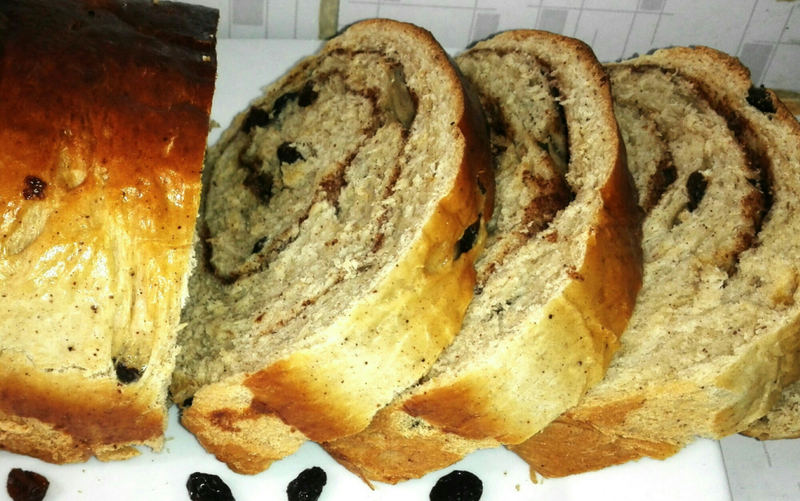 A yummy moist bread loaded with raisins and cinnamon. The best raisin cinnamon bread I've ever had! This recipe makes two loaves. I usually start by activating my yeast before starting up on anything else. In a bowl, I mixed in 1/2 cup warm water, two tablespoons sugar and my yeast.I set this aside and let the yeast activate, this takes about 8 minutes. The yeast will eat the sugars and a froth will form, this is what we are looking for. Just in case your yeast doesn’t foam up, discard and set up another batch. I proceeded to mix my dry ingredients. In a separate bowl, I mixed together my flour, 1/2 cup sugar, salt, and raisins, set this aside. I then mixed up my warm milk, margarine, and eggs till consistent. To make my dough, I went ahead and poured my activated yeast and my creamed butter,milk & eggs into flour mixture. Mix this up and knead for close to 8 minutes, your dough should me smooth and elastic, the good dough should stretch and not break apart when pulled. I greased a large ‘sufiria’ and set my dough inside, I covered it up with a dump cloth and let it rise for 1 hour in a warm dry place until doubled in size. I Dusted my working surface with flour, using a rolling pin,roll out your dough to a rectangular like shape, apply melted butter all over the surface generously, mix together 1/4 cup sugar & the cinnamon, sprinkle half of this on top of your battered dough. Proceed to roll the dough tightly. (roll up the long way) Roll this completely sealing the ends by folding them together to the bottom. Place the folded ends downside and the neat one facing up. I then went ahead and placed this in my greased bread tin,folded side down. Place this in a warm dry place and let it rise for about 40 minutes.I use my oven for this. After 40 minutes our dough would have Rosen and doubled up in size. This is totally optional but I usually mix 1 egg with 2 tablespoons of water, I then brush my bread with this egg wash, this will give your bread that nice golden look. Bake this in a preheated oven at 175°Celsius for 45 minutes. Let your bread cool for 10 minutes before shaking it off the tin. ENJOY.